Here is an example of the regular version and it’s Canadian Newsstand price variant with one of the rare Charlton variants! 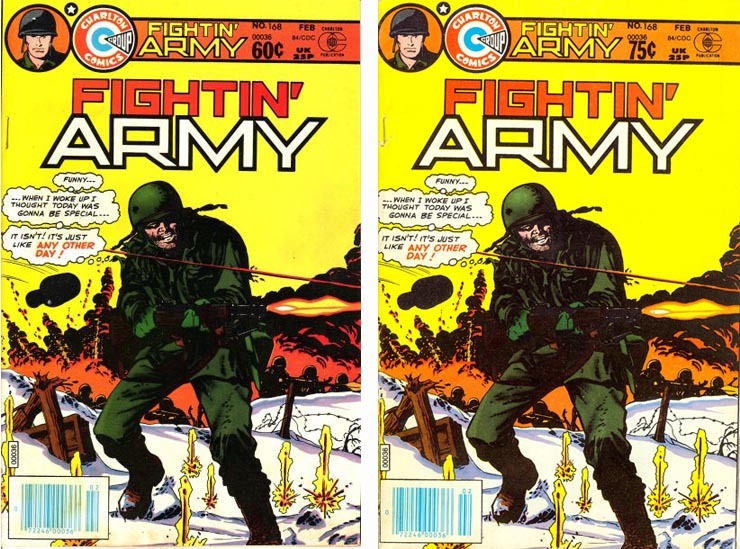 from 1984, on the left Fightin’ Army #168 regular version and on the right, the Canadian Newsstand price variant! Now that we have finished with the various series of price variant comics, we will move on in variant comic history to the second series of variant comic books, the printing variants. Just to clear up any potential confusion, let’s first talk about “reprints”. Reprints are not variant comics. Reprints are, as they say, a reprinting of a story or, of an entire comic book with a different issue number or, even as a different title. Some reprints are also packaged as second or third stories to fill-out the pages of a giant-sized issue, annual, special edition or a “100-pager”. Reprints were originally issued for series where the publisher was considering a cancellation of a title due to poor sales, but was unsure. Incredibly, one of today’s most famous comic book properties, “The X-Men”, went into a reprint phase for 5 and a half years, from issue #67 – #93 before the X-Men was re-invented by Chris Claremont with issue #94. Was the X-Men before it’s time, or was Chris Claremont a pure comic genius? So, let’s be clear, reprints are not variants. 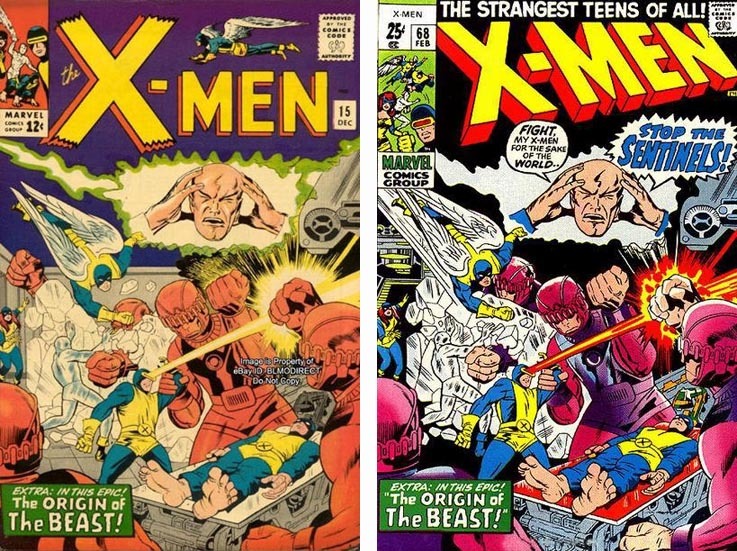 On the left, the original issue and on the right, reprints the cover (with alterations) and stories from X-Men #14 and 15! Now “printing variants” are technically not reprints and therefore are variant comics which occur when a publisher discovers that a certain issue of a comic sold so well, all of the copies that were printed (minus damages) were sold. If they see that there is more demand from potential buyers, the publisher prints a second run at the printing press, a.k.a. a “second printing”. The second printing most often carries the same publishing information, issue number and date. A little later we will talk about how second, third, fourth printings and beyond became popular and collectible. In the early days of comics, publishers distributed their comic books with magazine deliveries, for sales in stores that sold magazines, newspapers, etc. Anything unsold, or damaged (usually after 2-4 weeks) could be returned to the publisher. The publisher ate all the costs for printing issues that did not sell. Sometimes, stores didn’t even display some comics they received as their racks were already overloaded with titles that had proven sales, so those would go back to the publisher without having had any opportunity to sell. I remember in the early 1970s, asking my local friendly drug store manager if I could have a look in their boxes of unsold stuff, before it went back to the publisher. It was in those boxes that I regularly discovered comics that never made it out to the display racks. I didn’t purchase many of these as I guess I shared the drug store manager’s view that they weren’t interesting enough to display, or purchase. But, I digress.. I mention all this to point out that second printings under the old newsstand distribution system for new comics, was a high risk proposition for comic publishers. Any information on good selling issues would take well over two months to come back to the publisher. Any thoughts of producing a second print run of any issue carried a considerable risk for the publisher, if that second printing didn’t sell. 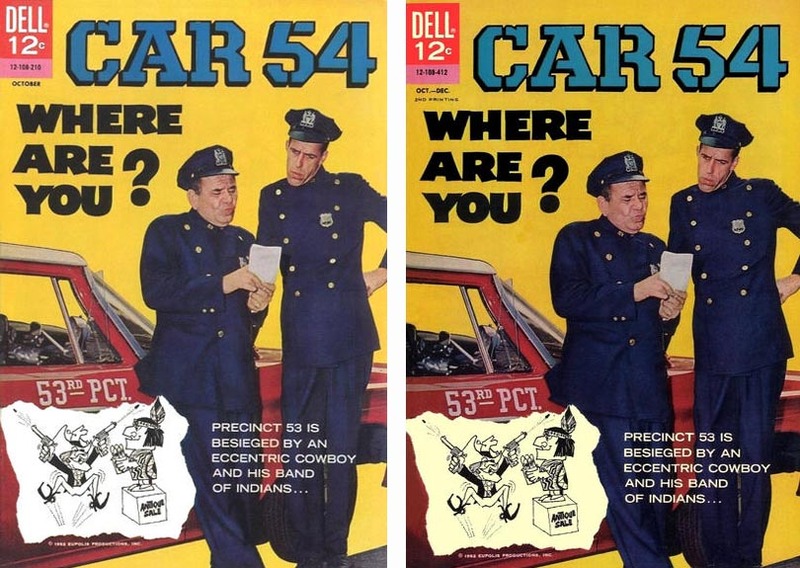 Car 54 Where Are You was a popular TV series and received a second printing (2 years after the fact) seemed a sure seller. On the left, the first printing from 1962. On the right, the second printing from 1964. Can you spot the subtle differences? So there you have it, the beginnings of second printings series of variant comics. In part 4 we will look at the evolution of the second (and subsequent) printings and why those printings evolved from being uncollectible to collectible and sometimes more desirable than the first printing! Part 4 is here Part 5 is here Part 6 is here Part 7 is here Part 8 is here. The History of Variant Comics Part 9 is here and is the last part of this series. Share the post "Variant Comics from then ‘till now – part 3!"